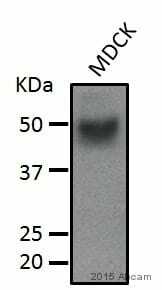 A 42kDa band is seen for some samples in addition to 50-54kDa band- we do not know the specificity of this band. 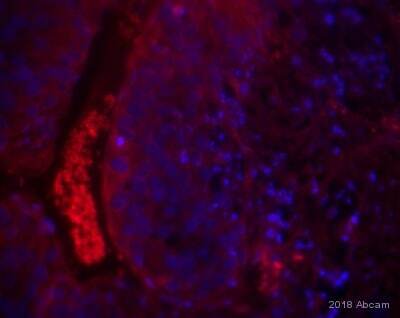 For example Rat kidney, heart, spleen have bands around 50kDa but rat PC-12 cells have single band at ~42kDa. Synthetic peptide within Human PTEN aa 350 to the C-terminus (C terminal). The exact sequence is proprietary. 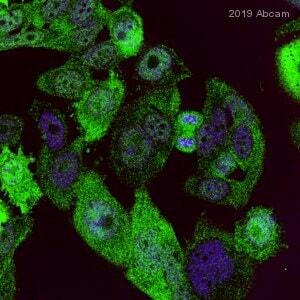 WB: HAP1, MCF7 and HEK-293 cell lysate; Human brain lysate; Mouse primary bone marrow derived macrophage whole cell lysate. Our Abpromise guarantee covers the use of ab32199 in the following tested applications. WB 1/10000. 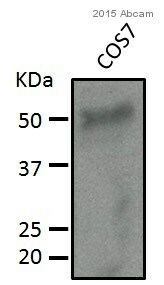 Detects a band of approximately 54 kDa (predicted molecular weight: 47 kDa).Can be blocked with PTEN peptide (ab157804). 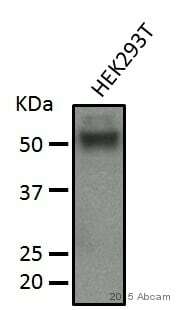 ab32199 was shown to specifically recognize PTEN in wild-type HAP1 cells along with additional cross reactive bands. 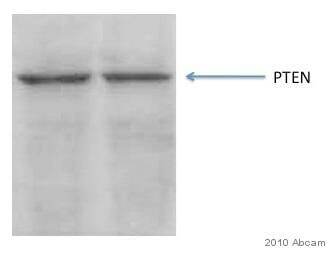 No band was observed when PTEN knockout samples were used. 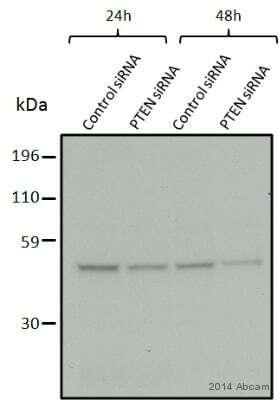 Wild-type and PTEN knockout samples were subjected to SDS-PAGE, ab32199 and ab8245 (loading control to GAPDH) were diluted to 1/500 and 1/2000 respectively and incubated overnight at 4°C. 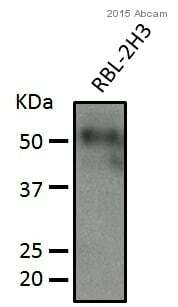 Blots were developed with Goat anti-Rabbit IgG H&L (IRDye® 800CW) preadsorbed (ab216773) and Goat anti-Mouse IgG H&L (IRDye® 680RD) preadsorbed (ab216776) secondary antibodies at 1/10,000 dilution for 1 h at room temperature before imaging. 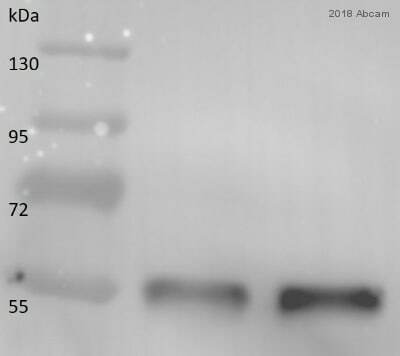 This western blot image is a comparison between ab32199 and a competitor's top cited mouse monoclonal antibody. Observed band size: 54 kDa why is the actual band size different from the predicted? Observed band size: 50 kDa why is the actual band size different from the predicted? 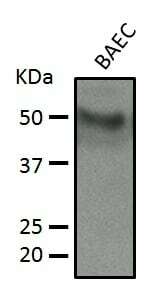 Western blot - Anti-PTEN antibody [Y184] (ab32199)This image is courtesy of an anonymous Abreview. Publishing research using ab32199? Please let us know so that we can cite the reference in this datasheet.